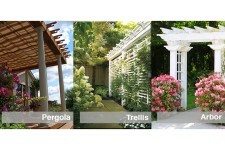 Pergola, Trellis or Arbor: How Can You Tell The Difference? 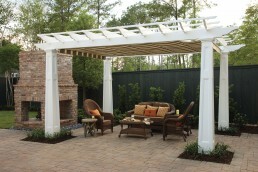 A pergola is an architectural element originally used in ancient Greece and Rome to better define an outdoor space. A pergola created an articulated sense of order between two spaces by using columns on the sides, which were connected by beams and topped with open rafters. Pergolas were also a good cooling off point between two buildings or along a pathway. With the increasing use of garden structures in landscapes, many are confusing the terms pergola, trellis, and arbor, using them interchangeably. When pergolas are covered with vines or foliage some call them a trellis, which it is not. A trellis is another architectural element usually made from a tighter weave of open framework or intersecting pieces called lattice. The trellis can be used horizontally to shade spaces or vertically to divide them. Most trellis structures are covered with vines, or flowers because the trellis helps support the vines and flowering foliage to grow longer, higher, and fuller. A trellis will allow sunlight to always penetrate, and they don’t offer any protection from the rain. Another garden structure is an arbor. An arbor is typically an open structure much smaller than a trellis or pergola, using interwoven lattice pieces and sometimes having an arched top. Arbors usually define a point of entry or the division of two places along a path. 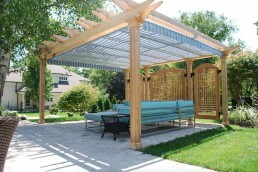 If you are seeking a defined covered space large enough for relaxing and entertaining outdoors; a place that offers the highest protection from the sun, wind, and rain, then a pergola with a retractable canopy is the best solution. Please complete the form below to download our free eBrochure. Retractable Canopy or Awning: What’s the Difference? Finally! A black and white explanation to the question , “What’s a Pergola/Trellis/Arbor?” Very very useful and on point! You win the internet!